Since 2014, there are more mobile devices on Earth than humans. Mobile applications utilize sensors of these devices to support users. 24% of the Android applications leverage users’ mobility data. This data allows applications to predict which places will be visited to provide users with transportation information or location-based advertisements. However, predicting human mobility is a challenging task. Existing solutions are typically optimized a priori for a particular application scenario. There is no approach that allows for automatically composing a mobility prediction solution. This approach is required to allow mobile devices to support a plethora of mobile applications running on them. Furthermore, 83% of the applications require the Internet to operate properly. However, mobile cellular network providers are struggling to provide necessary cellular resources with an expected 12-fold increase in cellular traffic by the end of 2021. The consequences are higher costs for both providers and consumers and a reduced quality of service due to congested cellular networks. Countermeasures such as caching strategies prefetch application content by predicting which applications will be used next. However, existing solutions suffer from two major shortcomings. They either (1) do not incorporate traffic volume data into prefetching decisions and thus generate additional cellular traffic or (2) require a modification of mobile application code. 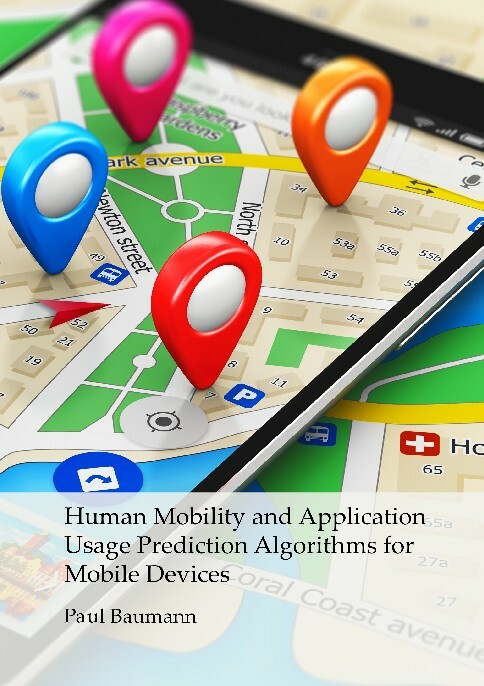 In this thesis, we present novel human mobility and application usage prediction algorithms for mobile devices. These two contributions address the aforementioned problems of (1) selecting a human mobility prediction model and (2) prefetching of mobile application content to reduce cellular traffic. In summary, the contributions of this thesis provide a step towards supporting mobile applications. With SELECTOR, we contribute an algorithm that optimizes the quality of human mobility predictions by appropriately selecting parameters. To reduce the cellular traffic footprint of mobile applications, we contribute with EBC a novel approach for prefetching mobile application content by leveraging application usage predictions. Furthermore, we provide insights about how and to what extent wrong and uncertain human mobility predictions can be detected. Lastly, with our mobile application LOCATOR and two human mobility data sets, we contribute practical tools for researchers in the human mobility prediction domain.